Graph databases offer sophisticated methods to uncover fraud and vulnerabilities. Banks and insurance companies lose billions of dollars every year to fraud. Traditional methods of fraud detection fail to minimize these losses since they perform discrete analyses that are susceptible to false positives (and false negatives). Knowing this, increasingly sophisticated fraudsters have developed a variety of ways to exploit the weaknesses of discrete analysis. Graph databases, on the other hand, offer new methods of uncovering fraud rings and other complex scams with a high level of accuracy through advanced contextual link analysis, and they are capable of stopping advanced fraud scenarios in real time. In this “Graph Databases in the Enterprise” series, we’ll explore the most impactful and profitable use cases of graph database technologies at the world’s leading organizations. This week, we’ll take a closer look at fraud detection. Uncovering fraud rings requires you to traverse data relationships with high computational complexity – a problem that’s exacerbated as a fraud ring grows. 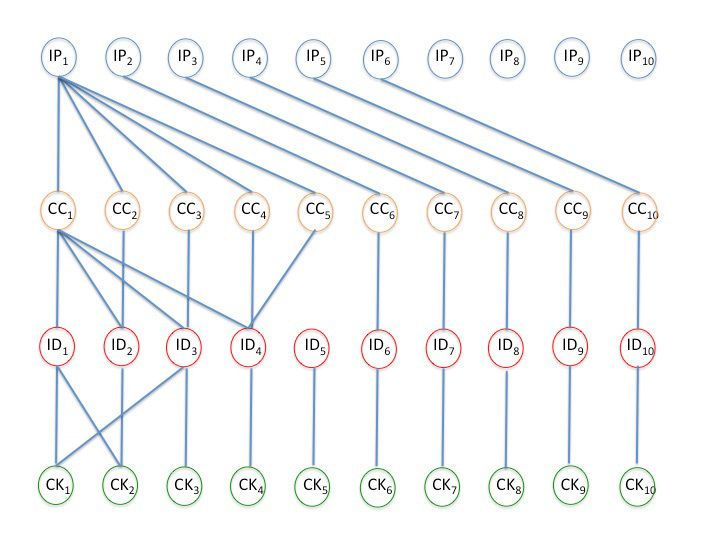 To prevent a fraud ring, you need real-time link analysis on an interconnected dataset, from the time a false account is created to when a fraudulent transaction occurs. Fraud rings are continuously growing in shape and size, and your application needs to detect these fraud patterns in this highly dynamic and emerging environment. While no fraud prevention measures are perfect, significant improvements occur when you look beyond individual data points to the connections that link them. Understanding the connections between data, and deriving meaning from these links, doesn’t necessarily mean gathering new data. You can draw significant insights from your existing data simply by reframing the problem in a new way: as a graph. Unlike most other ways of looking at data, graphs are designed to express relatedness. Graph databases uncover patterns that are difficult to detect using traditional representations such as tables. An increasing number of companies use graph databases to solve a variety of connected data problems, including fraud detection. As our lives become increasingly digital, a growing number of financial transactions are conducted online. Fraudsters have adapted quickly to this trend and have devised clever ways to defraud online payment systems. While this type of activity can and does involve criminal rings, even a single well-informed fraudster can create a large number of synthetic identities and to carry out sizeable schemes. Consider an online transaction with the following identifiers: user ID, IP address, geo location, a tracking cookie and a credit card number. Typically, the relationships between these identifiers should be (almost) one-to-one. Some variations naturally account for shared machines, families sharing a single credit card number, individuals using multiple computers and the like. However, as soon as the relationships between these variables exceed a reasonable number, fraud should be considered as a strong possibility. The more interconnections exist amongst identifiers, the greater the cause for concern. Large and tightly-knit graphs are very strong indicators that fraud is taking place. A graph of a series of transactions from different IP addresses with a likely fraud event occurring from IP1, which has carried out multiple transactions with five different credit cards. By putting checks into place and associating them with the appropriate event triggers, such schemes can be uncovered before they are able to inflict significant damage. 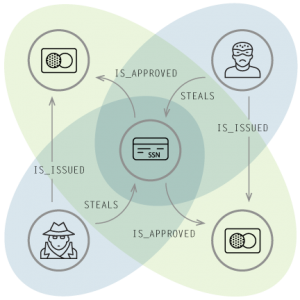 Triggers can include events such as logging in, placing an order or registering a credit card – any of which can cause the transaction to be evaluated against the fraud graph. Fan-out might be skipped, but complex graphs can be flagged as a possible instance of fraud. As business processes become faster and more automated, the time margins for detecting fraud are narrowing, increasing the need for a real-time solution. Traditional technologies are not designed to detect elaborate fraud rings. Graph databases add value through analysis of connected data points. Graph databases are the ideal enabler for efficient and manageable fraud detection solutions. From fraud rings and collusive groups, to educated criminals operating on their own, graph databases uncover a variety of important fraud patterns – and all in real time. Written by Jim Webber and Ian Robinson for Neo4j.